Info Andrew D. Gillum is an American politician who serves as the mayor and formerly served as a city commissioner of Tallahassee, Florida. At the age of 23, Gillum became the youngest person ever elected to the Tallahassee City Commission in February 2003. Gillum was born in Miami, Florida and raised in Gainesville, Florida, as the fifth of seven children born to Charles and Frances Gillum, a construction worker and school bus driver, respectively. He graduated from Gainesville High School in 1998 and, during that year, was recognized by the Gainesville Sun as one of the city's "Persons of the Year." He then moved to Tallahassee to attend Florida Agricultural and Mechanical University (FAMU). On May 24, 2009 he married R. Jai Howard; a fellow FAMU graduate. Gillum and wife, R. Jai have two children, Jackson and Caroline Gillum both born in 2014. Gillum served as President of the FAMU Student Government Association from 2001-2002, and was the first student member of FAMU Board of Trustees. He was recognized by the Congressional Black Caucus Foundation as "Emerging Leader for 2003". Gillum was also a Board member of the Black Youth Vote Coalition, a program of the National Coalition of Black Civic Participation in Washington, D.C. Gillum was elected to the Tallahassee City Commission prior to the completion of his college career. In 2003, Gillum was elected to a one-year term as city commissioner, and then subsequently reelected to a full term. He is the youngest person (age 23) to ever be elected to the Tallahassee City Commission. During the past decade he has spearheaded numerous projects to bring new economic life to Tallahassee. Gillum served a one-year term as Mayor Pro Tem from November 10, 2004 through November 9, 2005. Additionally, the joint body of City and County Commissioners, known as the Capital Region Transportation Planning Agency, elected him to serve as their chairperson for a year (January 2005 through December 2005). Gillum has also served as lead commissioner for the Long Range Community Based Target Issue Committee. After ten years as a city commissioner, Gillum begun his campaign for the office of Mayor of Tallahassee in 2013. Gillum was responsible for a number of community enrichment projects during his eleven years as a city commissioner. The Digital Harmony Project is an initiative championed by Gillum with support from the City of Tallahassee, local businesses and technology partnerships. Digital Harmony won the Significant Achievement Award in the Web & e-Government Services category from the Public Technology Institute. For the first two years, it provided every incoming Nims Middle School sixth and seventh-grader with a new desktop computer, free internet access and online academic curriculum training on core subjects. The school holds ongoing training courses for parents and students on basic computer skills and school curriculum. This effort places 200 computers into the homes of Nims Middle School students. Gillum championed the opening of the first Tallahassee Teen Center, The Palmer Munroe Center, which serves as a safe haven for many area youth and operates a restorative justice program. Restorative justice programs have shown significant success, compared to non-restorative measures, in improving victim and/or offender satisfaction, increasing offender compliance with restitution,and decreasing the recidivism of offenders. Gillum stressed these results as some of the reasons for the great importance of the Palmer Munroe Center. In government, Andrew led the City Commission’s efforts to institute a policy which returned $5.6 million back to Tallahassee’s local economy, reduced the initial security deposit for businesses, and enhanced opportunities for job creation. Andrew continuously seeks to institute mechanisms for greater transparency in operations as well as streamline the development permitting processes to enhance administrative efficiency and cost effectiveness for public private partnerships. He also voted with his colleagues on the city commission to approve a “fast track” permitting program within the Growth Management Department. The program set a performance standard which expedites the pre-construction permitting and planning processes without relaxing key quality and safety standards. The city commission now guarantees a seven-day approval process. Most recently, Gillum led the city’s development project Cascades Park, located in the heart of downtown Tallahassee. The park, built in 2013 doubles as a stormwater management facility, protecting local neighborhoods from flooding. In April 2013, Andrew Gillum announced his intention to run for Mayor of Tallahassee. 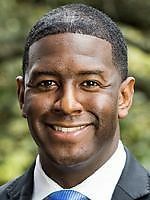 Initially Gillum was slated to run against three opponents; Larry Hendricks, Zach Richardson, and write-in candidate Evin Matthews. In the August 26, 2014 nonpartisan primary, Gillum defeated Richardson and Hendricks; capturing 76 percent of the vote, or 19,658 votes. On August 27, 2014, write-in candidate Evin Matthews withdrew from the race, resulting in Gillum becoming Mayor-Elect. Even before taking office, Gillum began meeting with mayors from many cities in order to learn from their successes. Additionally, he launched the Tallahassee Mayoral Fellows Program, in partnership with Florida Agricultural And Mechanical University and Florida State University, which allowed high-achieving graduate students to gain experience working in City government. Gillum was sworn into Office on November 21, 2014. In January 2015, Mayor Gillum strongly supported the City of Tallahassee joining in the Ban the Box campaign; arguing that the initiative does not stop the city from conducting background checks, but rather gives applicants a fair shot at employment and reduces recidivism. On January 28 the Tallahassee City Commission voted 3-2 to drop the box. On February 17, 2015 Mayor Gillum welcomed United States Secretary of Transportation, Anthony Foxx, to Tallahassee to kick off the GROW AMERICA Express Tour. Gillum also contributed to the DOT Fastlane Blog, in which he stressed the importance of long-term transportation investments for America's mid-size cities. In an effort to overhaul how City Advisory Committees, a series of local advisory boards, operate in Tallahassee, Mayor Gillum released a survey in March 2015 to gain feedback into the city's numerous boards and motivate citizens to get involved with local government. Also in March 2015, Mayor Gillum participated in a conference call with other Florida mayors and United States Deputy Secretary of Commerce, Bruce Andrews; a call in which Gillum stated his support for Congress to pass trade promotion legislation that would bolster international trade, and stressed the importance for local governments of a leveled playing field. On March 27, 2015, Mayor Gillum held the Mayor's Summit on Children, a large conference in which business and community leaders came together to learn about the importance of investments in quality Early Childhood Education (ECE). Speakers included Dr. Craig Ramey, distinguished research scholar of human development at Virginia Tech University, who spoke about the importance of ECE to language development and the vocabulary gap that can form between those who receive quality ECE and those who do not; and Rob Grunewald, economist at the Federal Reserve Bank of Minneapolis, who spoke about the importance of early learning to the long-term economic success of a community. On the heels of the Summit on Children, Mayor Gillum launched four community-led task forces as part of his Family First Agenda; these task forces, which Gillum introduced at the Summit, examine: Improved Quality and Affordable Child Care, Family Friendly Workplaces and Culture, Greater Community Investments in Children and Families, and Resources and Training for Parents and Families. Gillum stressed that investments in early childhood education have been proven to return six dollars for every one dollar invested; this is due to lowering community costs on those children as they grow older. In May 2015, Gillum launched a 1,000 Mentors Initiative, which aimed to recruit 1,000 men and women from diverse backgrounds to increase youth mentoring opportunities in Tallahassee, and help youth in need. Also in May 2015, Gillum, in partnership with several local and national organizations, orchestrated the Tallahassee Future Leaders Academy (TFLA), a summer jobs program which employed over 100 youths throughout city government. Gillum summarized the importance of a program like the TFLA in a July Op-ed, in which he highlighted how similar summer jobs programs from around the country have been shown to reduce arrests for violent crime, reduce youth mortality rates, and increase the likelihood of college attendance. In response to spike in shootings, Mayor Gillum, in conjunction with the City of Tallahassee, Tallahassee Police Department, and numerous community organizations, formulated and implemented Operation Safe Neighborhoods on June 2, 2015. This initiative called for an increase in law enforcement visibility and capacity; strengthening strategic partnerships and community programs/opportunities; and enhancing community engagement and response, through the implementation of a community watch program called, Neighbors on the Block. In October 2015, more than 400 strangers gathered around a 350-foot-long table in downtown Tallahassee to participate in the launch of The Longest Table, an annual initiative aiming to use the dinner table as a medium for generating meaningful conversation among people of diverse ethnic, religious, and political backgrounds. Organized by the Office of the Mayor and spearheaded by Community Engagement Director Jamie Van Pelt, the project won a $57,250 grant from the Knight Cities Challenge via the Knight Foundation.